← We saved a little Maven, just for you. Maven: trusted expert in a particular field, who seeks to pass knowledge on to others. With great success we launched our Lorna’s Laces + Heel gift sets, just in time for holiday. With VKLive right around the corner we thought we’d up the ante with an exclusive Soak colorway and gift set. We also thought you might want to know how custom colorways come to exist. So, here it is. 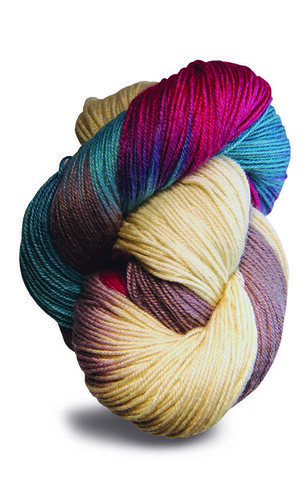 We’ve got 60 custom, numbered and signed skeins of Maven (our new colorway), with matching custom heel labels, in cute little gift boxes arriving just in time for VKLive. Be there, or be square. Once they are gone, they’ll be history (or socks, scarves, mittens etc.). So, where to begin. We sent this photo to Beth and Amanda over at Lorna’s Laces. These are our top scents to carry us forward (you should be very familiar with them by now!). We love our colors, we always have. Then, they went to work. Really, just like that! Before we knew it, we started receiving pictures back. It was super exciting. This is what newly dyed yarn looks like when it’s drying. Cool isn’t it? Then, we received this photo. It helped us decide exactly which shades worked, and which order the colors should be in. We thought and thought, discussed and discussed, and finally agreed on tones, intensities, colors and stripes. It was quite the challenge. We even consulted a couple of industry experts. This is the final skein (lovely, if I do say so myself). 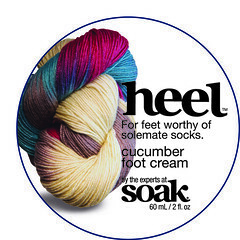 And here is the Heel label. It’s cucumber. Your favorite. Absolutely stunning! Is there a way to purchase one if we can’t be at Vogue live?! Lorna’s Laces is awesome when it comes yo colorways! I’ll save you a kit. It wont’ ship until after VKLive. Email me and I’ll follow up with the rest of the details. 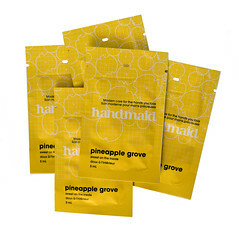 Thanks for being so passionate about our products! -Jacqueline. OMgosh! so pretty! I wish we could buy these because that mix is stunning! sadly i cannot be at VKlive, I can’t wait to see all the great new things unveiled there though! 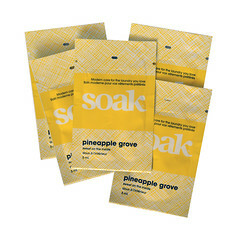 Did you see you can now buy this kit at http://www.soakwash.com? Hop to it! -j.